The 15 Minute Milestone: Are you Maximizing Your Registration Opportunity? It’s often said that you have only one chance to make a good first impression. In today’s healthcare environment, those words couldn’t ring truer. Never before have the initial interactions between provider and patient been more important — for both parties involved. Many patients face rising out-of-pocket costs because of high-deductible health plans or increased contributions to employer-sponsored health plans. The Kaiser Family Foundation reports the average annual out-of-pocket costs per patient rose nearly 303 percent between 2006 and 2016.1 That growing economic burden makes it essential for patients to gather as much information as early as possible in their continuum of care to understand their financial responsibilities and help ensure their care experience is as smooth and successful as possible. Providers, of course, also have a great deal at stake financially when it comes to first impressions. As self-pay collections steadily increase as a percentage of net patient revenue, healthcare organizations must now make improving patient collections and capturing payments a central focus of their initial interactions with patients. At the same time, providers must also keep patient satisfaction in the forefront as patients become more savvy healthcare consumers. In response to paying more upfront and out of pocket, patients are demanding more transparency, better cost estimates for procedures, more flexible payment options, financing alternatives and shorter wait times. These changes have pushed the challenges of patient access front and center. Healthcare organizations need to raise the bar with a patient access program that is cost-effective, delivers strong ROI and creates a competitive edge by providing patients with the information, access, convenience and quality care that make for a positive overall experience. Patients have some pretty clear limits to their patience when it comes to the check-in and registration process. A 2017 report by Vitals2 affirmed that the longer the wait time, the greater the decrease in patient satisfaction. Wait times average nearly 19 minutes across all forms of healthcare. But offices that have shorter-than-average wait times tend to have more satisfied patients. 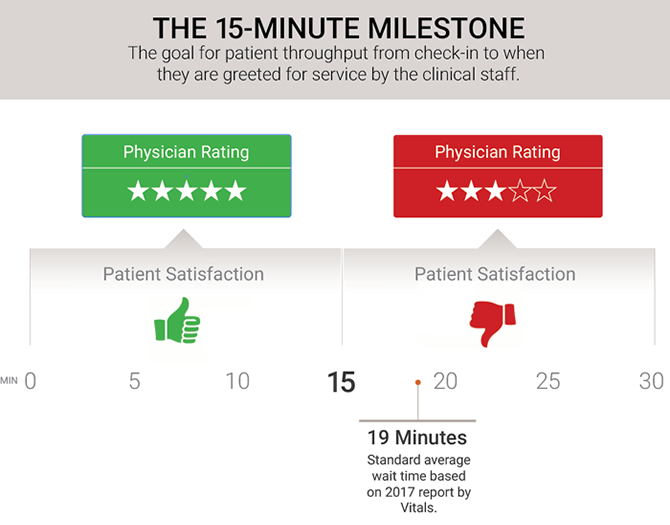 The Vitals study found physicians with five-star ratings have average wait times of less than 13 minutes, while those with 22-minute wait times receive only three stars on average. Against that backdrop, providers aiming to improve patient access should establish a goal of 15 minutes for throughput time — that is, the time that the patient checks in at the main entrance to when the clinical staff greets them for the service. But while efficiency is important, it can’t come at the cost of compromising accuracy. Healthcare organizations’ annual losses from denial write-offs range from 1 percent of net patient revenue to as high as 4 or 5 percent, according to The Advisory Board Co.3 Because the majority of information needed to submit a claim is generated during the registration process, many denials are due to inaccurate or incomplete patient information. Ultimately, your goal should be to create a holistic, streamlined approach to scheduling, registration and financial clearance. When done properly, this process goes beyond verifying benefits, obtaining authorizations or performing other isolated functions. Instead, it integrates the entire patient experience process into one single workflow while automating the many steps that must occur for the hospital to efficiently secure revenue, remain compliant and, at the same time, provide a best-in-class patient experience. The challenge, however, is that patient access staff are often hamstrung by complex processes and multiple bolt-on systems and cobbled-together applications that make registration and collections inefficient and error-prone. On top of that, ever-changing industry regulations and insurance payer claim requirements make it that much more challenging to register patients efficiently and accurately. Eliminated or remedied 95 percent of errors prior to bill drop. Reduced registration time by 15 percent. Experienced a 15 percent increase in patient payments prior to service while reducing patient access denials by 3.5 percent. Boosted productivity by frontline staff by 18 percent by establishing individual quality and productivity targets enabled by technology and real-time analytics. Beyond the bottom-line financial benefit, an integrated patient access program results in happier patients and physicians — which can have the added ripple effect of a morale booster for staff dealing with fewer complaints. The Kaiser Family Foundation. 2016 Employer Health Benefits Survey. September 2016. Vitals. Vitals Index Reveals Wait Times Are Decreasing. March 2017. Becker’s Hospital Review. 4 Ways Healthcare Organizations Can Reduce Claim Denials. July 2016.